While the second story perch provides a great view of the property simultaneously with a quiet retreat, the main level floor plan was designed with connections between people and places in mind. In any family of eight, the kitchen is a critical hub. Its location within the existing part of the house already works well for the main level bedrooms and a view down the stairs to the finished lower level, so care was given to keeping it open to the newly added living room as well. 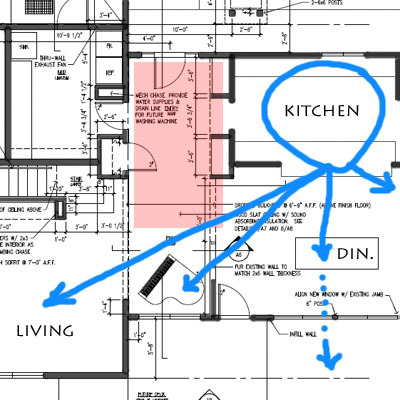 The current entry to the house (on the other side of the kitchen, and not shown above) was abandoned and was made into a small work zone with a desk for the kids' computer, and a new, larger entry (highlighted in red) was created where the old dining room used to be. This entry is directly adjacent to the family entry from the garage, keeping circulation to a minimum while still allowing for completely closing off the mess of the mudroom from the rest of the house. Directly across from the door is a space for the piano - close enough to the kitchen for mom to conduct lessons while preparing supper.